As an aspiring sequential artist, I really appreciate these step-by-step pieces. I'm curious though, what drawing media do you use for the sketches? 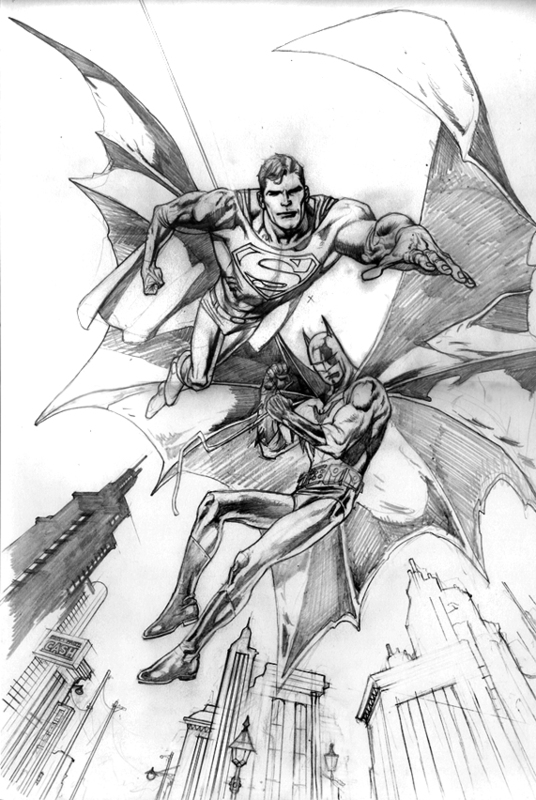 And what is the transition from sketch to finished pencils? It looks like parts of the finished pencils are taken directly from the sketch. 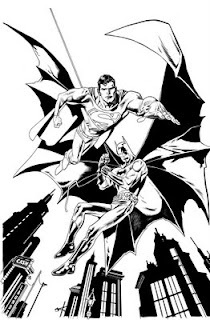 Or do you do a completely new drawing and trying to match the parts of the sketch that you like as closely as possible? Nice to see you back posting again, Kevin! 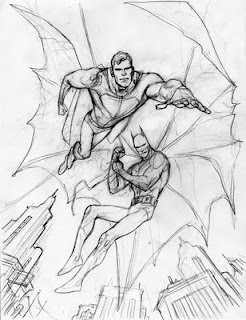 I have a prelim sketch of yours that's real close to this piece (Supes is in a slightly different pose). And hey, I'll finally get to meet you soon, in Baltimore! Looking forward to it...hope all goes well! seems your process is a 3 steps drawing..are you using lighhtbox? would love to see you doing superman batman comic.. btw what's your latest comic work..
me still waiting for you hellboy one shot comic..not yet arrive at my local comic shop. Josh, I usually start out with a thumbnail sketch, then draw an 8.5 x 11" layout. I make a larger copy of the layout and lightbox it onto the final 11 x 17" sheet of 2-ply Bristol. For thicker material, like masonite or matt board, I'll use my old Art-O-Graph opaque projector. As a last resort, I'll use the classic grid method but it's tedious. Dave, I'm glad you like the sign. I was just noticing how carefully I lettered the incomplete "Laundry" sign. I'm usually not that precise with the hand lettering in the background of pieces like this. Ken, we're looking forward to Baltimore as well. We had a great time there two years ago. Azhar, you're right, it's usually at least three steps. The new stuff can't be announced yet. Publishers don't like it when we get out ahead of them on this stuff.